I picked up this awesome Lawn Fawn Gnome Sweet Gnome set second hand and was eager to play over the weekend. 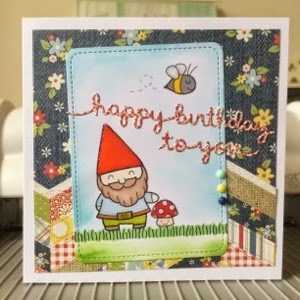 I have no idea who the recipient of this card will be, perhaps it's just me that thinks garden gnomes are cool! The Journalling card and the happy birthday dies are both Lawn Fawn too. The gnome is coloured with Promarkers, and I used Distress Ink for the background. The papers are Simple Stories.